How do you show your allegiance to your side of the Force? Is it with your deeds? Your affinity for wearing black cloaks? Putting the title "Darth" before your name? 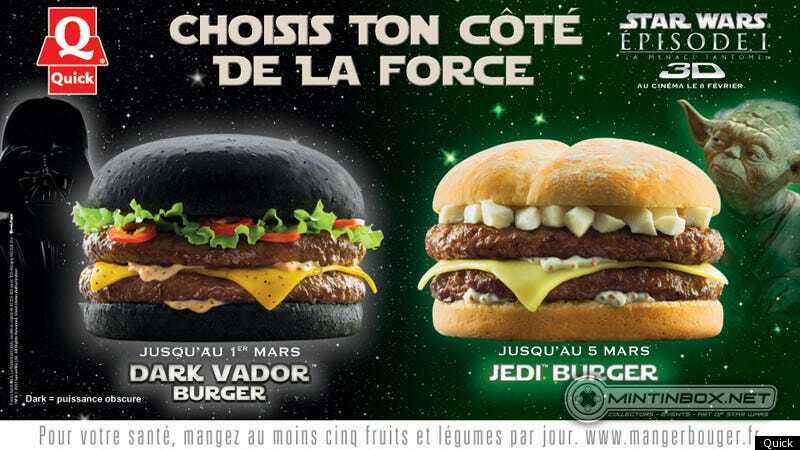 A French burger chain wants Star Wars fans to choose their side of the Force by choosing their burger. French chain Quick is planning to roll out Star Wars-themed burgers in honor of the 3D rerelease of The Phantom Menace. Starting in March, customers will be able to order a Darth Vader-themed burger with a bun dyed entirely black. I'm not entirely sure if it's the Vader burger because it's black, or because it slows your breathing to Vader-like levels. A Darth Maul burger comes with a ruddy bun, but sadly no black tattoos. To be honest, it's the Jedi burger that frightens me the most. The bun may not be green, but whatever is on top of that patty looks like little teeth. Even if I have to join the artificially colored Dark Side of the Force, I'd prefer not to order a burger that might bite me back.